The airport is about 20-30 minutes by car to the Global Scholars Hall. No buses travel to or from the airport, so you should make arrangements for taxicab or the Omni Shuttle. The bus stop is .4 miles from the Global Scholars Hall institute housing. You can walk to the EMx light rail/bus stop and take the 10 minute bus ride to Eugene Station, the main bus stop. Lane Community College Downtown Campus is located across the street. 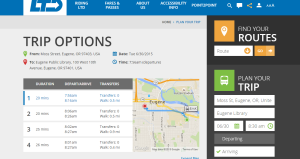 Here is the link to the Bus Travel Route planner. The Lane Transit District LTD has a real-time trip planner here. Here’s a Google Map with some restaurants and points of interest for your stay. All institute participants and facilitators should have received their stipends by now. Contact Anne McGrail if you still haven’t received your check! 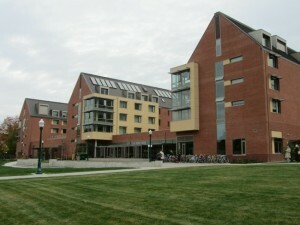 The Global Scholars Hall dorm at the University of Oregon is a half-block south of 15th Avenue on Moss St. In Eugene. Rooms are “jack and jill” style–with a bathroom between two single bedrooms. The Google housing form is complete. If you need to change your information, contact Anne McGrail directly.